Bottom line: The quitters in Week 17 outnumbered the players. Brent Grimes appeared on his wife’s podcast to defend his season. Tl;dr he’s delusional. Finally, we conjecture about what the Bruce Arians’ Buccaneers will look like. Get ready for eight more months of this, folks! While we’re busy looking ahead and guessing at what the new head coaching hire will bring to the 2019 Buccaneers, we thought this would be a perfect opportunity to take a look back at the 2018 season. The 2018 Buccaneers will perhaps be remembered for their inconsistencies, a record-breaking, high flying offense and the team’s perpetual controversies. The team will be forever changed after this offseason, but the 2018 Buccaneers will be one to remember. Mike Evans finished the No. 3 receiver in the league for receiving yards, right behind Julio Jones and Deandre Hopkins. The trio were the only receivers to break 1,500 yards. Four receivers finished with more than 750 yards receiving, only the fifth time in NFL history that has ever happened. The offense led the league in passing yards per game, with 320.3. Mike Evans averaged 17.72 yards per catch – third best in league history for receivers catching 85+ balls. He joins the company of Josh Gordon (18.92 in 2013) and Jerry Rice (18.26 in 1986). Behind him are the likes of Calvin Johnson, Tyreek Hill, Julio Jones, Michael Irvin. Mike Evans broke the Bucs single season receiving yardage record, toppling Mark Carrier, who has held the record since 1989. Mike Evans joined Torry Holt, Randy Moss, AJ Green, Julio Jones and Jerry Rice as the only players in NFL history to top 6,000 yards in their first five seasons. Evans was the youngest player to ever reach that benchmark. Mike Evans led the league this season in first downs with 68. The Bucs had four of the top 11 players in this category: OJ Howard (2nd), Chris Godwin (4th), DeSean Jackson (11th). Mike Evans career first down completions is the highest in NFL history at 79.2%. That tops players like Calvin Johnson, Vincent Jackson, Alson Jeffrey, Julio Jones and Rob Gronkowski. Bucs finished with 5,358 yard and 36 touchdowns, the most in team history for both measures. Jameis threw 88 career touchdown passes before the age of 25, surpassing Peyton Manning’s 85. Ryan Fitzpatrick broke his own career record in the Buccaneers Week 1 victory over the Saints. Fitzpatrick completed 21 of 28 passes for 417 yards with four touchdowns and no interceptions. He also rushed 12 times, gaining 36 yards and a touchdown. Ralph can’t talk about this kid enough. He missed most of training camp due to a calf strain sustained in practice, and didn’t hit the field until Week 4 against the Chicago Bears. His debut was less than extraordinary, earning him a nickname of “Velcro Vita” and many pundits and former players labeling him a bust. And then Jason Licht had a talk with him, and it appeared as if the gloves were off for Vita. With nearly 350-pounds of sheer brute force, Vita turned into a monster, splitting double teams, bullrushing through linemen to get to the quarterback and throwing blockers like ragdolls. He finished his first season with 28 tackles and three sacks in 13 games. These stats are identical to Gerald McCoy’s rookie debut. For all Jason Licht’s draft and free agency blunders, this one more than makes up for it. Early in the season, the Buccaneers were decimated by injuries in the secondary. The young guys that took over were often lost in Mike Smith’s defense, allowing opponents to pass at-will. Duffner addressed many of those issues and spared us from being one of the worst defenses in NFL history. The defense finished the season allowing opposing quarterbacks to complete 72.5 percent of their passes, second all-time to the 2016 Detroit Lions. It also allowed a 110.9 passer rating this season, second only to the 2015 New Orleans Saints, who allowed a 116.2 rating. Despite that, the defense showed flashes of greatness during the year. Safety Andrew Adams had a field day against the Carolina Panthers, picking off Cam Newton three times and tying Ronde Barber and Aquib Talib for the most interceptions in a game. Defensive end Jason Pierre-Paul ended the team’s double digit sack drought, ending the season with 12.5. The feat hasn’t been achieved since 2005 when Simeon Rice tallied 14. So, while it wasn’t the best defense we’ve ever had, it was far from the worst. And for that, we are thankful for Mark Duffner. Now, by no means is this an endorsement of one quarterback over the other, nor is it a critique of the decisions made by management. With Jameis Winston’s three game suspension, the Buccaneers were in a position where they needed a capable backup to take the reins until his return. Journeyman quarterback Ryan Fitzpatrick was just the guy to do it. We all knew this wasn’t going to be a long term solution, despite the observations fielded by the media (But why isn’t Jameis on the side of the stadium?????). Fitzpatrick, while showing flashes of an elite gunslinger, is nothing if not inconsistent. This season was no different. Thankfully, we have not one, but two inconsistent quarterbacks on our roster, and after Fitzpatrick was benched, Winston took the reins. And continued the meltdown. And then Fitzpatrick got another opportunity! And similarly melted down, allowing Winston to go back in and finish the season as THE quarterback. I could argue favorably for the Bucs on every count, and I have, but it doesn’t change the fact that the quarterback situation created instability within the organization and probably cost us at least a couple of games. Turnovers were, in Koetter’s own words, the downfall of the season. It’s nearly impossible to be a winning team with a turnover ratio of -18. And it was undoubtedly a team effort. The offense turned the ball over 35 times last season, with our quarterbacks, neither of whom playing a full season, ranking 5th and 9th for interceptions. The defense played its part as well. It ended the season with just nine interceptions and eight fumbles recovered, tying us at 22nd overall with five other teams. Eleven of the defense’s 17 turnovers came in the last six games, but a drought in the middle of the season put us in a hole for the rest of the season. Will Jason Licht ever live Roberto Aguayo down? Not this year! 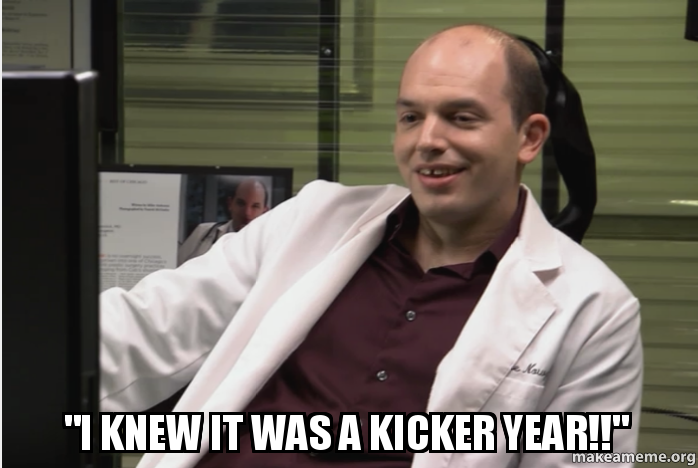 Hey guys, remember when we moved up in the second round to draft a freakin’ kicker?? And it went terribly wrong and we have had kicking issues ever since then? This season, Chandler Catanzaro, known for being a reliable kicker, succumbed to the Aguayo curse. He made 11 of 15 field goal attempts, missing all attempts from 40-49 yards and one from 30-39 yards. He also missed four points after before being released in Week 11. Cairo Santos took his place with a marginally better field goal made percentage than Catanzaro, 75.0 percent to 73.3 percent. All three of Santos’ missed field goals were 40+ yards, the same range where Catanzaro struggled. While it’s not high on the fan base’s radar (we have more pressing needs elsewhere), it may be a position to watch. Santos certainly won’t earn the fanbase’s trust until we’re able to successfully work through our PTSD. As the season has come to a close and the door has shut on the Koetter reign, we look forward to what a new coach will bring. Nevertheless, for posterity’s sake, we reminisce about the ups and the downs of last season, as we will never see this team again. Molly and Ralph go over what the all-22 coaches film showed us as to what went wrong with the loss to the Saints. There’s nothing more disconcerting than a division loss. Well, except for maybe a nearly-flawless first half, followed by an ugly second half. At the end of the half, the Bucs led in time of possession, first downs, the turnover margin, and most importantly the score. The Saints tallied an abysmal 3 yards rushing on 9 carries. Drew Brees threw his fourth interception of the season. The Buccaneers even came out strong after the half, with a Carl Nassib strip sack with a JPP recovery early in the third quarter. However, the momentum changed after back-up quarterback Taysom Hill blocked a Bryan Anger punt. After that, it was game-on for the Saints. They ended the game with 298 total yards, 100 of those rushing. They led us in time of possession with 31:53 to our 28:07. They even made a garbage time interception on Winston, breaking his three-game streak. The offensive line was just offensive. In addition to the penalties, Winston was sacked four times and hit 10. Winston made several bad passes with defenders in his face that would have been costly against a better secondary. Overall, the first half will be forgotten and it will be characterized as an ugly game for the Bucs. Two missed field goals, perhaps attributable to the rain. An unnecessary roughness penalty on Jensen led to a heated exchange between him and Winston on the sideline right before the half. A failure to execute on both sides of the ball. The Saints were able to clinch the division and a playoff berth today with their win and the Panthers loss. Questions about the future of the Buccaneers have resurfaced.